When the topic of storing energy from solar panels comes up in our conversations, we’ve noticed many people automatically think of the residential market. But in truth, despite the often noted dropping costs in PV and battery technologies, keeping up with the Joneses when it comes to having a state-of-the-art eco-abode is not economically viable. At least for most of us. At least not yet. Storage is, however, economically viable for commercial and industrial customers thanks to a little thing called demand charges. While both residential consumers and commercial consumers pay for the amount of energy consumed (kWh), billed on a $/kWh basis, only commercial entities have to pay hefty demand charges (kW) on top of that. Demand charges are added fees based on the peak electricity usage measured in 15 minute intervals. A short period of high electricity use, or peak, will set the demand charge for an entire billing period, and it’s billed at different $/kW rates based on time of day and time of year. (Learn more about kilowatts vs. kilowatt hours here.) 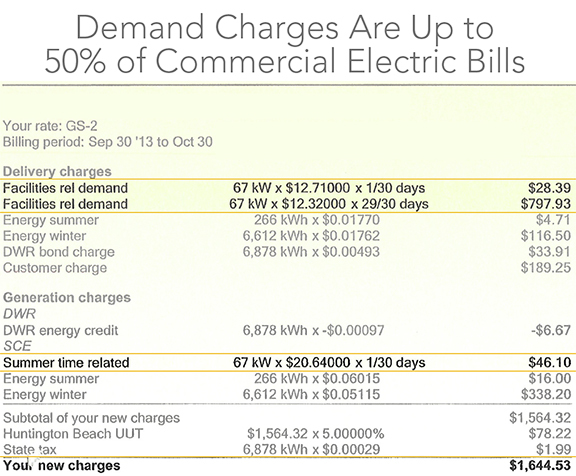 For many commercial customers, demand charges contribute up to 50% of their electricity bill as illustrated to the left. To dig in a bit further, residential customers pay only one rate of charges for electricity service, covering both consumption and demand. This simple, combined charge is possible because there is relatively little variation in electricity use from home to home and it would cost utilities more to meter every home than they could reasonably charge. Whereas commercial and industrial (C&I) energy users have electricity use – both consumption (kWh) and demand (kW) – that varies greatly depending on the type of business. The energy needed to run elevators in a high rise commercial building constantly during office hours, for example, is very different than that of a power heavy manufacturing plant that runs machinery for short periods during the daily manufacturing cycle. Meeting each commercial customers’ unique needs requires utilities to keep a vast array of expensive equipment to meet peak consumption periods, which they offset with demand charges. Businesses and building owners who face daily economic and operational risks, gain financial and operational benefits from using energy storage (with or without solar) to significantly reduce peak demand and optimize energy spend. While commercial load profiles vary greatly across industry segments, energy storage provides economic benefits for a single building, or even an aggregated portfolio of buildings. For buildings that have solar generation, solar + energy storage is a very economically viable solution and the addition of storage provides a clear pathway to future applications including back up power for critical operations, energy self-sufficiency, and grid-independence. We have no doubt that residential applications will become a smart option in the future, and when they do, we’ll be there. For now, the greatest opportunity for immediate economic, environmental and operational benefits lives primarily in the commercial and industrial world. And that’s why the C&I sector is the core of CODA Energy’s business. At CODA Energy, we believe businesses and corporations hold tremendous power to lead by example and create this critical mind shift. Providing advanced, UL certified energy storage systems to C&I customers is our way of contributing to the greater goal shifting our society to a resilient, low-carbon economy.